We have spoken about other brands of smartlocks with increasing regularity, here. There are some interesting products that have made their way to market and along the way, some users find little bugs that make them just somewhat difficult to set up, install and operate. Enter the Sesame Smartlock. Installs to almost any deadbolt lock on the market. Is super easy to use and set up and is wifi connected (if desired), so you can operate the lock remotely. Options, like guest access, lockout function, even sense. The Symlis Sparrow is a novel product that is designed to fit on your keychain (hence why it makes it to this blog). Smartphone users across the world in need of extra charge for their product are often hampered by requiring to always be carrying their OEM charging cable. This intelligent and very new product is currently sourcing crowd funding through Indiegogo. You can purchase it through Indiegogo. It offers a small form factor and portable charging cable for either Apple or Android phones and tablets. It also provides a built in flash drive for access to files you want to view on your device/s. It is not an actual battery charger. But it is a cute keyring. We originally posted this article in September 2010 and have seen a great many views of the page. 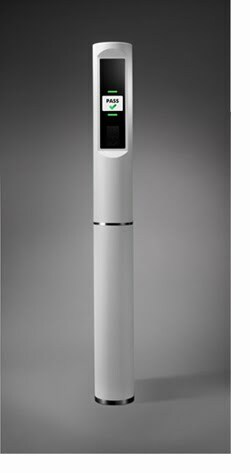 There is absolutely no doubt that advancing technology is influencing many significant parts of our daily lives and with new products from Aoptix Technologies like the one pictured here, we will soon be seeing this advanced wizardry in everyday use. The AOptix InSight™ VM iris recognition system takes the qualities that make the originalInSight system so extraordinary and wraps them up in a new form factor that is compact and visually appealing. Keys have been in use since nearly 4,000 years ago, according to clay tablets that depict keys used in the Babylonian Empire. The first of these keys looked nothing like the historic keys we might imagine today. Some, in fact, may have been as long as an arm and quite heavy. No way you’d have a keychain filled with these keys. Similar keys were used in Ancient Greece, most likely to lock temples and other structures of significance. They keys were so large that women carried them over their shoulders. You can view one of these at the Museum of Fine Arts in Boston—the key that once locked and unlocked the Temple for Artemis Hemera in Arcadia. Where we begin to see the stirrings of modern keys was Rome. The Romans took the technology developed by the Greeks and refined it for more common use. Of course, only those with belongings to protect were concerned with locking their doors. The keys of this time resemble the skeleton keys we think of when “historic keys” some to mind, but they weren’t quite as advanced. During the 6th century, European keys took another leap forward. Lever tumblers within locks were created, so keys could be even more specialized. One look at these keys, and you can see exactly how they may have preceded our modern keys. These keys also featured more decorative accents, which often featured crosses or the shape of a bishop’s miter. Lock technology didn’t advance much for hundreds of years. The advancements that were made mostly occurred in England, most notably the double-tumbler lock invented by Robert Barron in 1778. Then in the 1860s, Linus Yale, Jr. of Massachusetts brought us right into the future with his cylinder lock. From that point on, lock technology grew by leaps and bounds. While we still use some variation of the models produced by Linus Yale, Jr., we also have some technology the Ancient Greeks and Babylonians might have considered supernatural. Current transponder keys make it possible to enter and exit a vehicle without even touching the key. And, believe it or not, Hosse & Hosse can help you with historic locks and transponder keys. The lock mechanisms from Ancient Greece are no longer in use, so we can’t help you there. However, if you’d like to repair a lock or produce a duplicate key for your home built in the 1800s, we can. We can also reproduce the transponder keys for your cars and keycards for digital commercial locks if you lose them. That’s one of the most fascinating things about being Nashville’s locksmith and security hardware provider for 150 years. We’ve seen it all, and we can still do it all, too. Hosse & Hosse Safe & Lock have been proudly serving Nashville Tennessee for 150+ years, providing the region with locksmith and safe sales and services, architectural hardware, entry systems and good old fashioned customer service. Hosse & Hosse are the oldest continually operating locksmith company in Tennessee and the 7th oldest business in Nashville Tennessee. Located in 918 Woodland Street, Nashville TN 37206, they continue to serve residents, businesses and institutions with premium quality lock products and services. Kickstarter is a well known crowd funding platform that pairs developers with investors but sometimes a product fails to make it to it's target. The Keebunga looks like a really intelligent product that would benefit any beachgoer. Designed to withstand pressure to a depth of 90 feet, this simply designed yet intelligent product could be the life saver beachgoers have been seeking. Beachgoing, often means leaving your chip key (car key) somewhere dry and protected from the elements but you cannot guarantee the security of where you leave it...that it will be there when you return. With Keebunga, simply take your (expensive) chip key with you when you swim, surf, dive or ski, confident it will still work when you return to your vehicle. If you go to the beach....you know what it's like to go for a swim, concerned that nobody will nic your stuff that you leave on the beach while dipping. With Keebunga, that issue is solved. 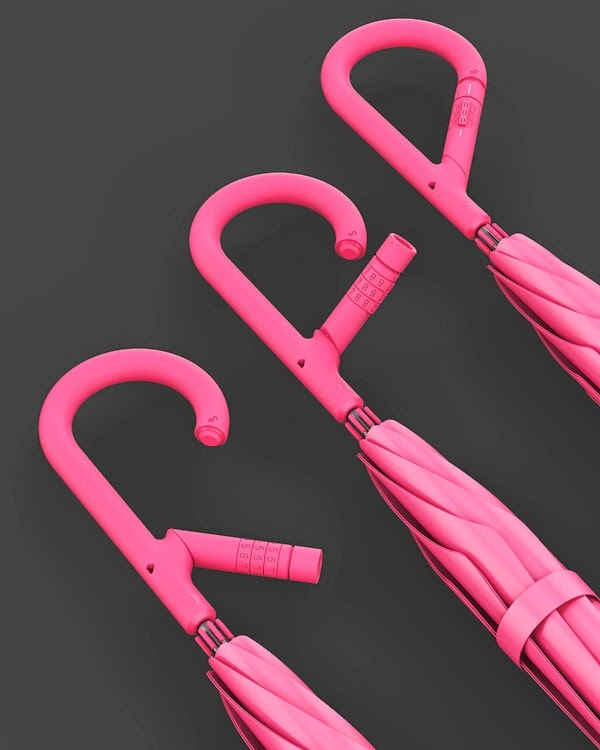 This concept umbrella is designed with an intelligent 3 wheel combination lock, preventing theft of your weather protector. Still a design concept, it won an award at last years Red Dot Awards. 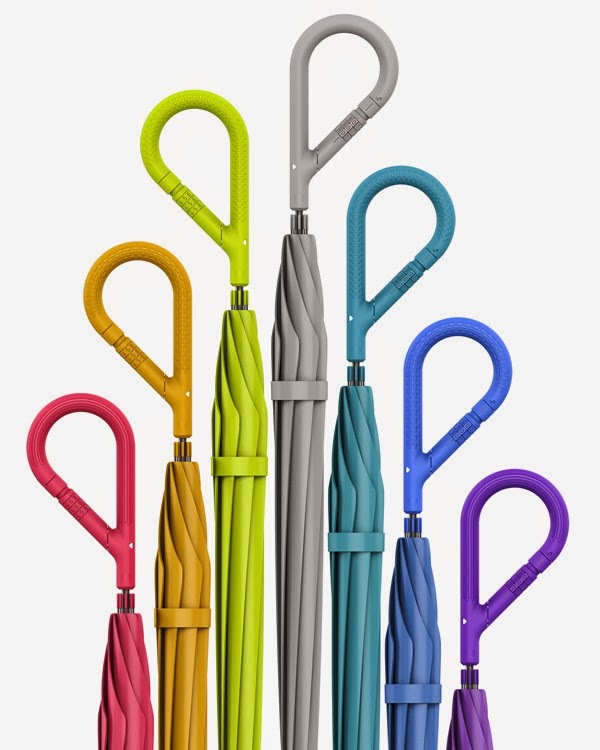 Simple to produce and said to come in many different colors, will this product get made? Here is an interesting, if novel product that can be helpful to those intending to secure an electrical socket, switch, cable connection etc. Simple to install and obvious in it's appeal, the Keyponents Transparent Lockable Sliding Lid Outlet Cover enables communal rooms in hotels, conference rooms, schools etc, to secure the switches from prying hands. Set the ambient room temperature and leave it secured from tampering. Prevent your cable wall connection from coming out. prevent little children from putting their hands where they dont belong. Want to make sure no one but you can access a particular electrical socket? Another, 'why didnt I think of that' product! Today's shiny new security products that are sold just about everywhere, have all the bells and whistles and will even make you coffee in the morning (yeah, right), are quite the rage, arent they?.....or are they? 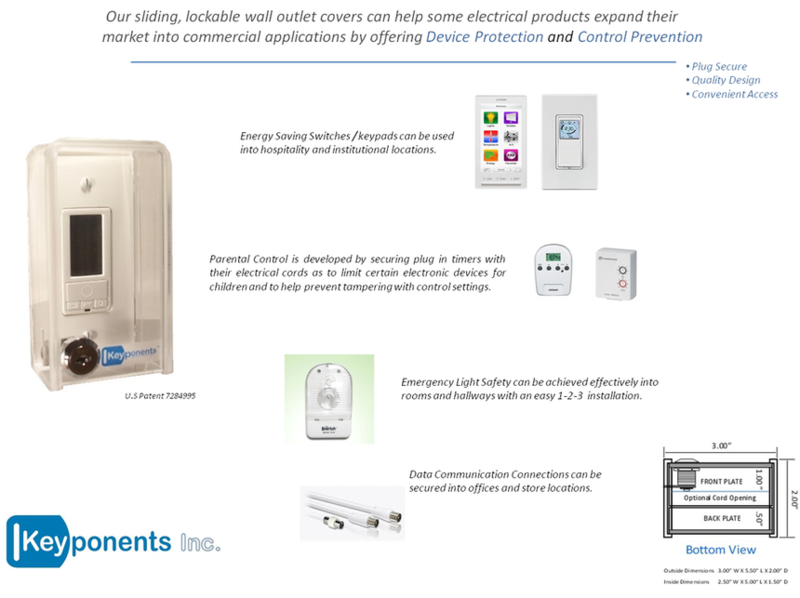 HP recently completed a study to determine the effectiveness and quality of 10 leading brands of home security products that use real-time monitoring of access control and security for their effectiveness. The result (from this study), indicated that every home security system (tested) contained significant vulnerablities including but not limited to password security, encryption and authentication issues. HP's Fortify On Demand security service recently tested the offerings from 10 different companies based on video cameras, motion detectors together with cloud and mobile based communication protocols. It found none of the systems required the use of a strong password and 100% of the systems failed to offer 2-step authentication processes. Connected home security systems are becoming one of the more common Internet of Things (IoT) products that we can all see, touch and use easily today and many manufacturers are climbing aboard this runaway marketing train, to eake out some market share with fast to manufacture components that lack fundemental data security protections. It is almost as if they dont care about peoples data security and given the alarming increase in data theft over the last couple of years, are they selling us short? Having been involved in commercial, residential and industrial security around the world, across the last 2 centuries, we continue to recommend a separation between perimeter security products (deadbolts, door handles etc) and electronic add-on products, like cameras, card swipe access control products and alarm systems. Using a mechanical security product as your first and last line of physical security is necessary to keep you secure today. I continue to recommend high-security key control and mechanical access control solutions to all consumers , intent on maintaining the safety and security of their dwellings, offices, institutions and families. I do believe that the 2-step authentication process will be a major factor in the coming years to protect all users of a security system, because our protection and the protection of our fellow workers, our children and our loved ones, is far more important than having the latest and greatest, you beaut widget that sings for us. 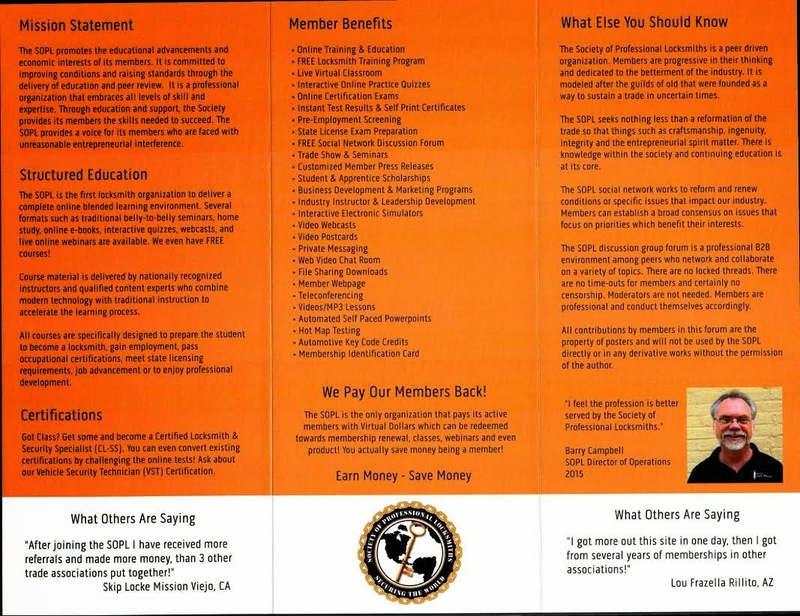 The Society Of Professional Locksmiths (SOPL) just introduced a new flyer that will be available at many up and coming trade shows. 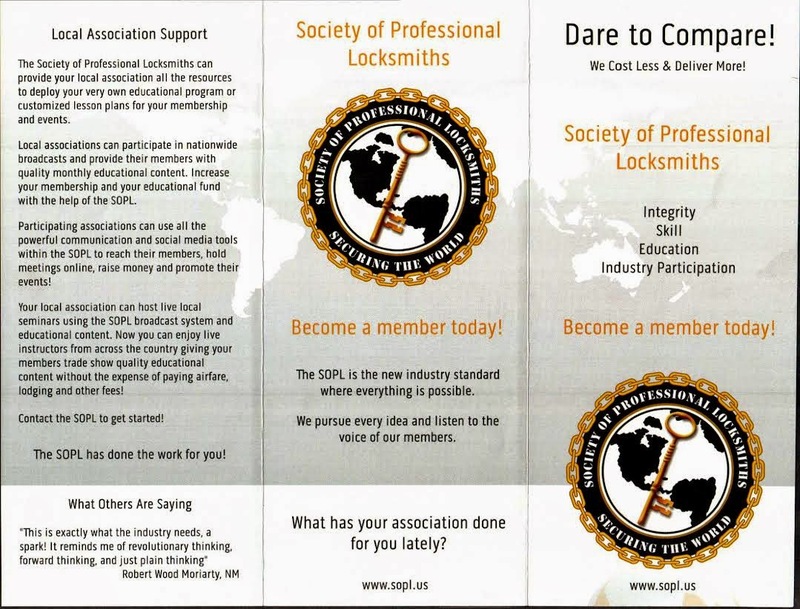 The SOPL is the pre-eminent organization for the modern day professional locksmith. This fraternity of locksmith professionals, is seeing massive growth of it's member base, thanks to it's core education and training modules, modern discussion forums, member benefits and knowledgeable industry instructors, suppliers and significantly experienced locksmith tradespeople. The opportunities presented by industry respected administrators in SOPL, bring to life modern and exclusive products, services and training for existing technicians wishing to improve their business accumen and industry knowledge or for those new to the industry. Our very popular Lockwood 7444 Keyed Pocket Door Lock has been selling like hotcakes until recently when sales just stopped to a halt. Thanks to a returning customer, we just discovered that the buy now link was indicating the product as sold out. It is not. We have corrected the link and apologise for any inconvenience. Click on the picture to the left if you would like to order.